In 1881 a train carrying McCloud Rainbows to be stocked back east broke down in Crane, Missouri. Rather than lose all the fish they dumped them in the local spring creek. They are still there, a successful breeding population of what may be the purist strain of Rainbows left in the world. So the story goes. It's probably more complicated than that, but the trout are there and they are wild. It's tough tight fishing for very spooky fish. My friend Chris H. and I spent last Friday on Crane Creek and caught four fish and two of those were babies. There had been heavy rains earlier in the week and the water was high and cloudy but not blown out. We hoped this might work in our favor by making us less visible to the trout. I had never been there but had heard all the stories and was excited but also a little intimidated. My goal was to catch a fish. Late morning I caught my fish. 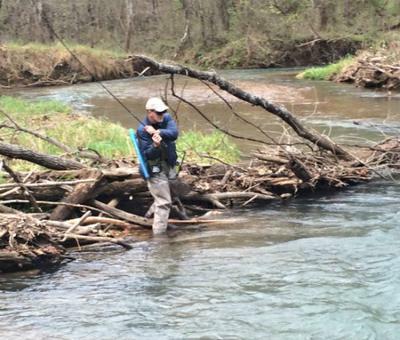 A big logjam blocked off a bend in the creek and created a big swirling hole below a riffle. I put a pheasant tail nymph with a large bead head on the Tenkarabum 36 and went for the bottom. On the second or third cast I felt a tap and hooked a nice 10 inch fish which came in with out a problem. Got the picture, a McCloud on the books. The next cast got another hit. This was great. I pulled it towards the surface-- it came up about a foot. It felt like a big catfish only faster. I was able to turn the fish but not really control it. At one point it was close enough to the surface that a I got a look when it turned. It was at least mid teens in length. I may have hooked bigger trout but never a stronger one. At one point I had it close enough to almost grab the line but by then it had had enough of me and headed for the logs. 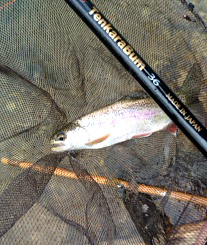 I gave a big pull on the rod not realizing that the fish already had a half hitch around a log,(line as well as tippet). The fifth section popped like a firecracker. I want to be clear, the fish did not break the rod. I broke the rod. When the fight started I made a point of keeping the rod low and in front of me, letting the rod do the work. Were was Rob Worthington when I needed him? As time went by the adrenalin built until I'd achieved the clinical condition known officially as " all jacked up". The odds of me landing this fish were probably pretty small to start with, logs or now logs. Except for the small issue of me destroying the rod the Tenkarabum 36 did a great job casting everything from an overhand worm to that big Czech style pheasant tail. Folks stay off of Crane in the winter for the spawn but I'll be back in the Spring. Thanks for the great trip report! A great Thanksgiving morning read. Happy Fishing! Alan this answers my question about the rod, I'm sorry but I'm sure a replacement section will be coming! Hoping for rain to stop in Texas. I have fished Crane Creek twice. Once in the fall when the water was real low. Fish were really spooky. Caught one small rainbow. Next time was last spring after the heavy rains. Creek was blown out. Did you fish in town or above the railroad bridge? Crane Creek conservation area has two sections: from the city park north past the railroad bridge and a separate area about a mile south. Tom Davis's video is taken in the north section. The big fish was hooked in the lower area which usually has more and deeper water. McCloud River Red-sides are spectacular fish in theirbnative waters of the McCloud watershed. However, stocking them all over the US and throughout the world has created ecological disasters and contributed to the destruction of native fish populations. I've been here since yesterday 3/5/16 and have been catching the McClouds. Very skittish and beautiful fish. Having a great time. I too lost a decent sized McCloud when it darted under a log. They are strong fighters. Loved the article. Thanks for sharing. There is a population of McClouds in the northwest (Lake Michigan) side of Michigan's lower peninsula. These wild fish have been cut off from Lake Michigan and competing steelhead since the early 1900s when they were planted and remain unhybridized to this day. A truly beautiful fish.